It is with great disappointment that I read AM Simon Thomas' claim that our previous Plaid AM encouraged investment at our hospital and, by implication, no cuts. This type of declaration is misleading; despite the fact that since 1999 the unit has had some significant investment, little of this was into core acute services, which have been left to deteriorate. Famously Helen Mary Jones pledged that acute surgery would only be lost "over her dead body". It transferred to Carmarthen, and Helen is not dead, but no longer with us as an AM. Over the years since our first merger in 1999 there has been a steady asset stripping from the hospital, with the loss of many staff and many services transferred elsewhere or downgraded. Consultants who have tried to preserve their services such as Hugh Evans and Carol Thomas have been treated shamefully and forced out of their jobs. What few services have been grudgingly expanded in no way compensate for the loss of much of our emergency first aid for illness and accident. Both of Llanelli's major political parties have failed to deliver on hospital care, despite their local members constant assurances that they are 100% behind the long campaign to keep our services. While funds are casually expended on other health board projects in distant hospitals, the medical services required for the health and well-being of Llanelli people are allowed to wither quietly, in the hopes that voters will neither notice nor care. Plaid and Labour want your votes and believe that you will vote for them however poor the standard of healthcare they have delivered and this kind of careless disrespect for the people should not be rewarded or tolerated. We must all stand together on this issue of retaining the services in our hospital. It is pointless to sit and argue over which party has blundered more completely: The people of Llanelli have been let down across the board by almost every one of them at this point. If we are complacent, if we show our politicians that they can make the same bad decisions, the same broken promises and allow services to be removed with no repercussions then they will do so. If they can be voted in time and again regardless of how poorly they treat the people they should be serving, why should they bother to make any real effort to change now? There are no saviours waiting somewhere else to help us. It is not enough to grumble and be cynical and accept that politicians will always let us down with empty promises and poor excuses. We deserve decent healthcare and the respect of the Hywel Dda board, not to be treated like fretting children who just don't understand that the sweets belong to someone else. Hywel Dda Health Board and its predecessors have stripped the heart from our hospital and now expect us to go west to make up the numbers in Carmarthen and Withybush where their departments need more patients to justify their own existence. This is crazy when we have the Swansea hospitals, with better access and often better quality departments close at hand. Before coming to work in Llanelli I worked in 2 areas with large rural populations in the North of Scotland and Northumberland. I have never seen such a dogs dinner of health services that we have ended up with in the Hywel Dda area. Forget the political point scoring, we need to all stand together and say NO! The people of Llanelli have had enough! 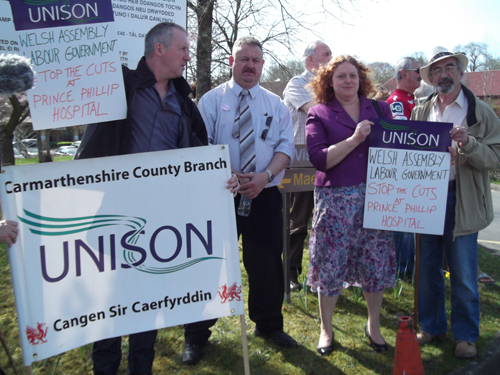 On 28th March 2012 more than 600 people attended a silent protest at the removal of services from Prince Philip Hospital. Pictured above are three of the People First candidates that joined the protest that day: Steve Bowen (centre of picture), Dr Sian Caiach, and Clem Thomas (in hat). Steve Bowen also gave an interview to camera that can be seen here on the SOSPPAN (Save our Services Prince Philip Action Network) website.